For posterity, WebGrrrl.net 2.0 which last appeared on 18th April, 2018. There’s this thing called Steemit. It’s been awhile since my last blog post here, but visit my Steemit blog and you’ll see a whole different story. Earning its altcoin called Steem and Steem Dollars is just one of the great experiences I find when blogging on that platform. User engagement there is fantastic. Granted, they’re not organic, but they’re still your audience nonetheless. Because Steemit isn’t necessarily SEO-friendly per se (one reason is because its authority is all over the place on so many broad topics), you won’t see too many people spamming in the comments, so less hassle for me in terms of managing comments. Users are very generous on DOWNvoting i.e. flagging your content if they ever find your comments spam-like. Steemit’s platform usage has been phenomenal this past 12 months, and unfortunately now it’s very difficult to get an invite to use the platform without paying for it or being really good at coding. Bloomberg specifically has been keeping an eye on Steemit’s growth via this article and a live interview with its creator, Ned Scott. Check them out if you want a balanced view of this platform. My newly (and honestly not quite complete) redesigned WebGrrrl.net has been bringing me lots of good contacts and clients with small and big projects. For instance, I gave a total of 2 consultation hours providing step-by-step advice for a client who wanted to do a pretty little modification on the Accessibility Widget I built for WordPress. The end result is the image below. I love the fact that I’m extremely busy doing something I love. The only downside to this is the amount of time I’m stuck sitting down. It’s quite unhealthy, especially when I get so engrossed in completing my tasks. If you’re looking for some WordPress help, reach out to me via my contact form in the front page, and we’ll see what we can do together. Hey Lorna, I was checking my old blog post and while checking my readers’ websites from their comments I saw yours. Clicked your name and I arrived here to find your blog is very much alive and kicking! Congrats on the new design and everything. 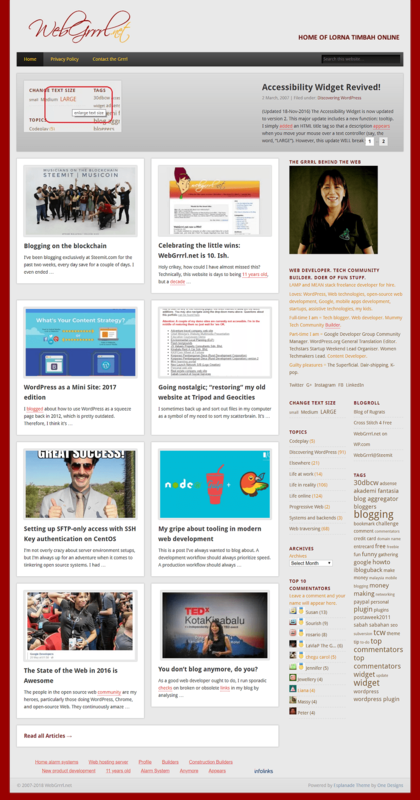 Coincidentally, I am planning to resurrect my blog Sabahan.com too from the dead lol.. Updated the design and stuff and planning about new stuff to write lol. You know who to look if you need a theme made pro bono from scratch yeah? Most of the same SEO techniques from 10 years ago still applies heheh. I look forward to the whole new Sabahan.com!